Designing, building, and marketing new cars is expensive, even for the largest automakers. If they’re strapped for cash (e.g., BMC in the fifties and sixties) or overcome by hubris (e.g., General Motors in the eighties), it’s tempting to share platforms between models or even slap a new grille a new badge on an existing model and pass it off as a new product for a different division — a technique sometimes called badge engineering. As confusing and potentially alienating as badge engineering can be for consumers, imagine how the people at their divisions feel when they’re handed an existing product and told to make something new and different out of it. Such was the case with Pontiac’s “pony car,” the 1967–1969 Pontiac Firebird and Firebird Trans Am. It’s the spring of 1966 and you are John Z. DeLorean, recently minted General Manager of GM’s Pontiac Motor Division. You came to work for Pontiac in 1956 under Semon “Bunkie” Knudsen, helping him transform the staid Pontiac lineup into GM’s performance leader. Shepherded by Bunkie and his successor, your old boss Pete Estes, Pontiac trounced upstart AMC/Rambler and stalwart Plymouth to seize the coveted number-three slot in U.S. sales, right behind Ford and Chevrolet. Now, Pete Estes has moved on to become the general manager of Chevrolet and you’re running Pontiac — the youngest man in GM history ever to hold such a position. 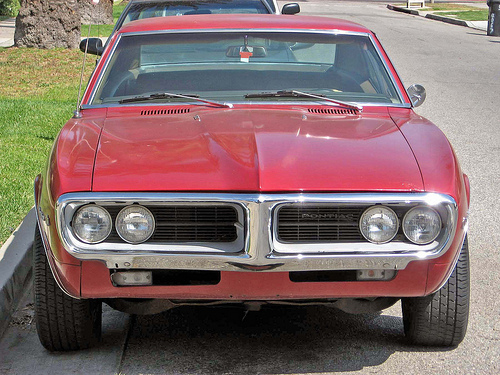 Make no mistake: Pontiac’s success is built on boldness and an aura of sporty performance. Senior management hates it and the European-oriented car magazines call it hokum, but it works. The big-engine Tempest you and Bill Collins cooked up, the GTO, has sold far better than the bean counters dreamed possible and become the hot car for America’s burgeoning youth culture. You even scored a minor coup by giving it a standard Hurst shifter, a status symbol among the hot-rodding elite. The kids are car crazy and Pontiac is In. You know, however, that Pontiac’s position is dangerously ephemeral. You’ve been out of real racing for more than three years on the direct orders of GM brass, who warned that they don’t want you competing even under the table. The GTO is doing well, but practically every time you come up with a new way to promote it, you get an angry call from chairman Jim Roche’s office, telling you to tone it down. Now, the other divisions are jumping on the GTO bandwagon with their own big-engined A-bodies: Oldsmobile’s Cutlass 4-4-2, the Chevrolet Chevelle SS396, and even Buick’s Skylark Gran Sport. Ford and Chrysler are getting into the act, too. Engine-wise, you know you don’t have anything to compete with Chrysler’s newly revived Hemi, which means that the GTO is in danger of being left behind when it comes to raw performance. You still have the Grand Prix, Pontiac’s riposte to Ford’s posh Thunderbird, but it’s too expensive for the kids, and in spite of (or maybe because of) the usual longer-lower-wider restyling, it’s bleeding sales alarmingly. On top of that, you now have a new problem: the Ford Mustang. When word of the Mustang first got out, GM didn’t take it too seriously, figuring it was just another dressed-up Ford Falcon like the Sprint, which had already bombed. By the time the dust settled, the Mustang had sold more than half a million units and it’s about to top the one-million mark. Those are serious numbers and worse, they’re hitting the same youth market that you tapped with the GTO. The Mustang has already killed the Corvair and it has the guys at Chevrolet in a panic trying to come up with some kind of direct competitor. You figure the best solution for Pontiac is to create a sporty image leader: not just a midsize car with a big engine, but an actual two-seat sports car. Back in 1963, when you were still chief engineer, you started working on a slick fiberglass-bodied car called the XP-833, showing it off at auto shows in 1964. Everyone thought it was a concept, but you set up a top-secret task force to develop a running prototype as a possible production car powered by the new overhead-cam six you’ve got coming up for the Tempest. After becoming general manager, you and Bill Collins sprang the finished prototype on Jim Roche along with a slick proposal showing a market for more than 30,000 units a year. The corporate brass just stared blankly at you and said no. The Corvette Sting Ray has yet to break 30,000 sales a year, they say, and the Banshee would just cannibalize its sales. The truth is that upper management honestly doesn’t understand who’s buying Corvettes or why. The wizened gentlemen upstairs just don’t get it. What the corporation wants you to do is develop a Pontiac version of Chevrolet’s new Mustang-fighter, the Panther, which is slated to debut in the fall of 1966 as a ’67 model. Known as the F-body, it uses a modified version of the semi-unitized platform from the next-generation Chevy II/Nova. You’re not exactly thrilled — even when Bunkie was in charge, you guys understood that offering warmed-over Chevys would be bad news for Pontiac’s image. But the brass has heard that Mercury is coming out with an upscale version of the Mustang called Cougar, and they want Pontiac to take it on. You dig in your heels for as long as you can get away with, but in March 1966, your boss, executive VP Ed Cole, tells you to make a Pontiac out of the Panther, later to be renamed Camaro. 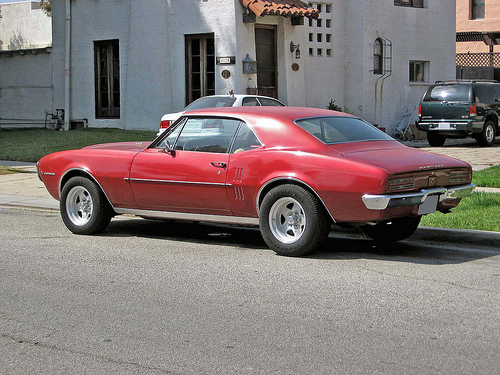 The 1967 Pontiac Firebird’s kinship with the contemporary Camaro is immediately clear; they share the same bodies and the same 108.1-inch (2,746mm) wheelbase. Firebirds are slightly longer and a little heavier, thanks in part to Pontiac’s V8, which weighs more than a comparable Chevy engine. A coupe like this weighs around 3,500 pounds (1,587 kg); the heaviest combination, a 400 convertible with air, weighed close to 3,900 lb (1,760 kg). If you were to design a sporty car from scratch, it probably wouldn’t be the F-body. It’s the first GM platform designed using computers, but it has some serious flaws and it looks like the gentleman in accounting may have stacked the punch card deck. The big problem is that rear suspension, a simple Hotchkiss set-up with a live axle carried on parallel leaf springs. There’s nothing wrong with that — the Mustang and every other erstwhile Mustang fighter on the market uses the same setup — but the bean counters have stuck you with the same “Mono-Plate” single-leaf springs as the Chevy II/Nova. Those springs might be just the ticket for giving grandma’s six-cylinder go-to-market car a nice, smooth boulevard ride, but when it comes to putting big-engine torque to the ground, they just don’t cut it. To make matters worse, you’re getting barely any distinct sheet metal to dress up the Panther/Camaro body shell. That means you’re going to have a hell of a job keeping the car from looking exactly like the Chevrolet, something Pontiac has been trying to avoid for the past decade. As if all that weren’t handicap enough, you’ve got barely over six months to make it all work, which in this business is like handing a fellow an assignment at 4 o’clock in the afternoon and telling him you want it first thing in the morning. (The usual lead time is at least two years, usually three or even four.) Still, you know you’d better make the best of it so you can get to work on the second-generation model. With this nose, the 1967 Pontiac Firebird is 188.8 inches (4,795 mm) long, compared to 184.6 inches (4,689 mm) for the 1967 Camaro. The big problem sales-wise is going to be the styling, so chief Pontiac designer Jack Humbert and his team gets cracking on a quick facelift of the Chevy shell. Humbert is like you: young, hip, and fashion-conscious. Since they can’t really do any major surgery, it all has to come down to a nose job and some tinsel changes. The guys add a new pointed bumper/grille combination, a distinctive, beak-like protuberance that adds about 4 inches (100 mm) to the nose. Combined with dual-quad headlights, the front at least looks different from the Panther/Camaro. In the rear, a set of slotted tail lamp covers like the ones on the ’66-’67 GTO add a nice bit of family identity. There’s not much to be done about the sides, but some chrome hash marks over the rear fenders provide a little visual relief. A close examination still immediately reveals the car’s kinship with its Chevy sibling, but at least it looks like a Pontiac. 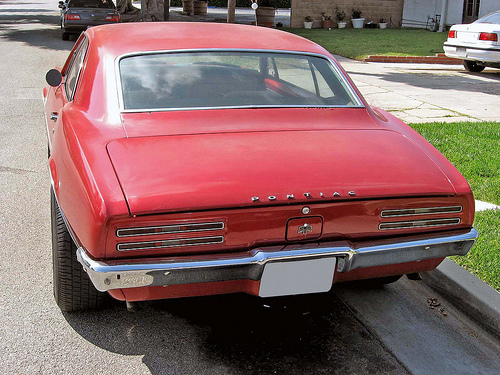 The 1967 Pontiac Firebird’s slatted taillights are a styling feature shared with the contemporary GTO. With the sloping tail, trunk space is not a key Firebird attribute; much of the rear compartment is occupied by the spare tire. Fortunately, GM management still hasn’t yet figured out that it would be cheaper to have a few shared, corporate engines, so with a couple of notable exceptions, each division still makes its own. In your case, that means the sturdy and dependable Pontiac V8 introduced back in 1955, for which you’ve developed a good range of performance hardware. You also have that new-for-’66 six, a 230 cu. in. (3,769 cc) job with a real novelty for an American engine: a single overhead camshaft driven by a rubber timing belt. You also have a high-po Sprint version of the “cammer,” used in the 1966 Tempest Sprint, making 215 gross hp (160 kW) with a four-barrel carb. It’s a natural for the Firebird as a flyweight complement to the heavy V8s. Hell, it has 15 hp more than the Mustang’s base V8. 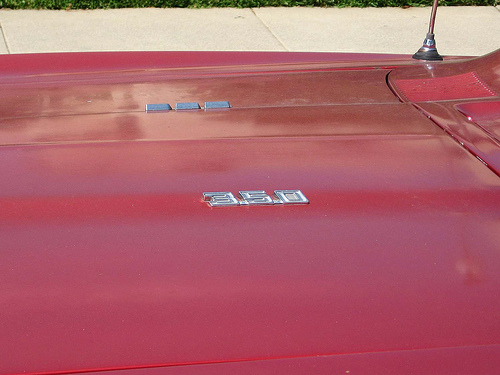 The numbers on the hood of this 1967 Pontiac Firebird say “350,” but the 350 engine was not offered until 1968. Unlike Chevrolet, which had distinct small-block and big-block engine series, the Pontiac 326 (5,340 cc), 350 (5,798 cc), and 400 (6,554 cc) V8s were substantially the same engine, differing mostly in bore, stroke, and state of tune. (As a side note, with a bore of 3 7/8 in. (98.4 mm) and stroke of 3 3/4 in. (95.3 mm), the 350’s actual displacement was 353.8 cu. in. (5,798 cc).) Since this car lacks H.O. badges, if it’s really a ’68, it probably has the $105.60 350-2V rated at 265 gross hp (198 kW) and good for 0-60 mph (0-97 km/h) in about 10 seconds. The equivalent 1967 engine was the $95.04 326-2V, with 255 gross hp (190 kW). 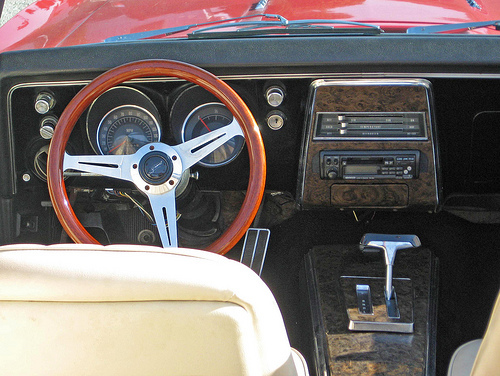 The standard dash of the 1967-1968 Pontiac Firebird had only a speedometer and a fuel gauge — full gauges or a tachometer were extra-cost options. So, too, was the console, although bucket seats were standard equipment. The console shifter is for the two-speed automatic; the steering wheel is not stock. You figure the real image leader will be the 400 (6,554 cc), the newly enlarged version of the 389 cu. in. (6,372 cc) engine that’s been powering GTOs and Bonnevilles throughout the decade. With almost 200 pounds (90 kg) less weight than a GTO, the 400 should be a natural for the F-body. Unfortunately, just when you think that’s settled, the corporation slams on the brakes, limiting the F cars to 350 cubic inches (5.7 L). That would make your car’s top engine option the 285 hp (213 kW) 326 (5,340 cc) V8, which isn’t enough for serious drag strip work. Once again, the brass is trying to cut you off at the knees. 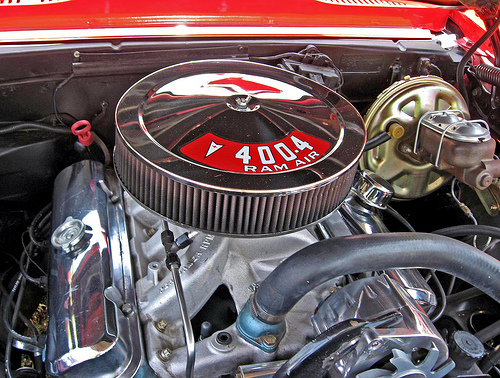 The Pontiac Firebird’s top engine option in 1967 and 1968 was the Ram Air 400. In 1967, this was a very rare, very expensive option, priced at around $600. On paper, its only effect was to raise the horsepower peak from 4,800 to 5,200 rpm, with no actual increase in the 325 gross horsepower rating (242 kW). This was what we may delicately call a fib, as the identical engine in a 1967 Pontiac GTO claimed 360 gross horsepower (269 kW), a rating that was probably also somewhat understated. 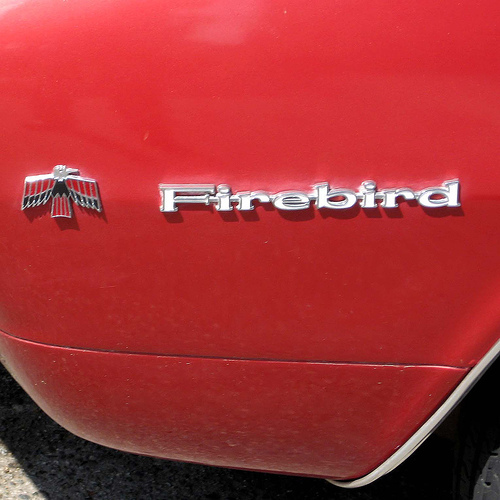 Only 65 Firebirds were sold with Ram Air; this may or may not be an original car. At first, it seems like Chevy will be in the same boat, limiting the Camaro to the new 295 hp (220 kW) 350 cu. in. (5,733 cc) small block, but then Pete Estes hears that Ford is about to offer their big-block 390 cu. in. (6,391 cc) V8 in the Mustang. He pulls some strings and gets permission to add Chevrolet’s big-block 396 (6,488 cc) Turbojet V8 as the top Camaro option. You cry foul and the Executive Committee finally, reluctantly agrees to authorize the 400 cu. in. (6,554 cc) engine for the Camaro’s Pontiac sibling. Unfortunately, there’s a catch — literally. GM has a new policy that no passenger passenger car other than the Corvette will have more than one rated horsepower per 10 pounds of shipping weight, so the same 400 cu. in. engine that makes 360 gross hp (269 kW) in the GTO is limited to a nominal 325 hp (242 kW) in the F-body, thanks to a metal tab on the throttle linkage that prevents it from opening all the way. No matter; you’ll make sure it’s conveniently missing from all the press cars and you won’t be surprised if owners do the same with their own rides. With the cammer, the 326, and the 400, your F-car sounds like a Pontiac and runs like a Pontiac, so the next order of business is the suspension. The easiest, quickest fix for the hapless rear springs is to add a pair of adjustable traction bars to the rear suspension for all of the high-powered engine options. It’s not ideal, since traction bars with leaf springs can sometimes lead to binding, but the bars reduce axle hop for hard launches, which is what buyers will care most about. Only the most charitable critics will say the traction bars eliminate the hop, but they help. A few changes to spring rates and shock damping and the car rides like a Pontiac, too. Sure, there’s not much suspension travel and the ride gets skittish and jittery on rough pavement, but the Mustang is guilty of that, too, and it doesn’t seem to have hurt its sales. Unlike the rival Mustang, the 1967 Pontiac Firebird and Chevrolet Camaro were offered in only two body styles: a hardtop and a convertible. The Mustang also offered a fastback, but the hardtop outsold it by a significant margin. The semi-unitized F-body lost a great deal of rigidity in convertible form, leading to the addition of four 35 lb (16 kg), oil-filled dampers in the corners of the body to reduce vibration. The result is that a Pontiac Firebird convertible is significantly heavier than a comparable hardtop. You have one last ace in the hole: the options list. What made Pontiac a lot of money, even in the dark days before Bunkie, was that you could customize your Pontiac with every optional gewgaw known to man. That’s no longer a unique idea, as witnessed by the lengthy option list for the Mustang, but Pontiac still does it like nobody else. Your base hardtop model will go on sale with a price of $2,666, but adding every conceivable non-conflicting option can push that to more than $4,500, making it a very profitable item. And you have a few eye-catching gimmicks the others don’t, like a hood-mounted tachometer. There’s one remaining hitch: what to call the car. At first you figure you’ll call it Banshee, after the XP-833 show car, and why not? It sounds menacing and menacing is exactly what you want in a sporty car. Then some spoilsport at the ad agency looks it up and sees that according to legend, the banshee’s wail means a family member is about to die. The skittish souls on the 14th Floor don’t like the sound of that, so the name is unceremoniously axed. After a bit of ferocious brainstorming, you end up with the name Firebird, borrowed from a series of turbine-powered GM show cars from the early fifties. Despite strong engines, a major detriment to first-gen Pontiac Firebird performance was the fact that if you wanted automatic with the lesser engines, you were stuck with a two-speed. (This transmission, sold by Oldsmobile as the Jetaway Hydramatic and Buick as the Super Turbine 300, was not the same as Chevrolet’s two-speed Powerglide.) The vastly superior three-speed Turbo Hydra-Matic was restricted to Firebirds with the big 400 cu. in. (6,554 cc) engine. By comparison, any Mustang or Barracuda, even a six, could have a three-speed automatic, giving them better all-around performance. 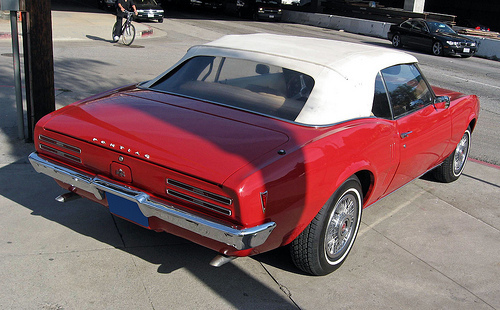 The first Pontiac Firebird goes on sale in February of 1967, about six months after its Chevrolet sibling. Despite the late arrival and a $58 higher base price tag, the Firebird manages to move 82,565 units against 220,906 Camaros. Ed Cole is pleased and so are you. The new Firebirds aren’t the two-seat sports car you wanted, but they have formidable performance, at least with the right engine. The base six with automatic is pretty slow, of course, but the four-speed Sprint can crack 60 mph (97 km/h) in less than 10 seconds, while the 400 can do it in a bit over 6 seconds — and, more important, run the quarter mile in the low 14s at nearly 100 mph (160 km/h), right off the showroom floor (minus that annoying little tab on the throttle linkage). These are the sort of suds Pontiac fans have come to expect. The following year you add a few new engine choices, tack on the side-marker lights demanded by the feds, and drop the vent windows, a dictate from Styling. The Mono-Plate springs and traction bars are abandoned on the more powerful F-bodies in favor of multi-leaf springs and staggered shocks — one ahead of the axle, one behind — to better resist axle tramp. Sales climb to 107,112, not bad at all. A further 87,001 Firebirds go out the door for 1969, despite an ill-advised facelift that rubs a lot of people the wrong way. The 1969 total includes 697 examples of the new Firebird Trans Am, a high-performance model that will cost Pontiac $5 per car in license fees to the Sports Car Club of America (SCCA) [of which “Trans Am” remains a registered trademark], but that you figure will be worth it for the promotional value alone. 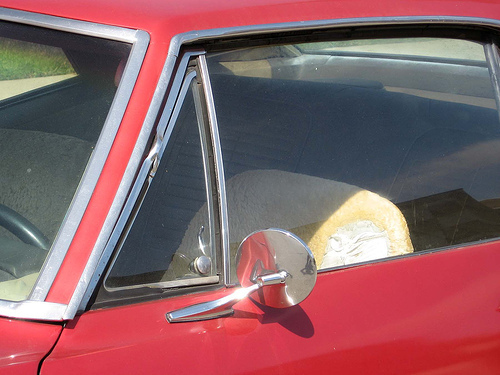 Side vent windows clearly mark this hardtop as a 1967 Pontiac Firebird; they were deleted on 1968 and 1969 models. GM introduced vent windows — sometimes called “ventiplanes” and originally advertised as “Fisher No Draft Ventilation” — in 1933 and started phasing them out in 1966 in the interests of style. Flow-through ventilation didn’t quite compensate. 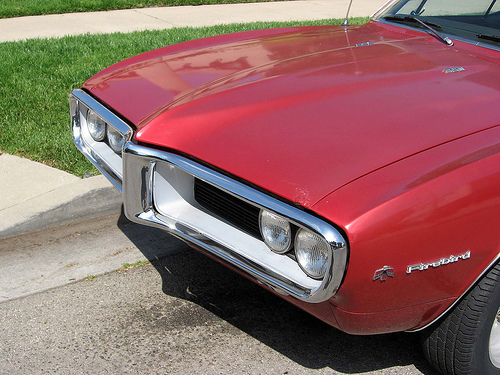 The 1969 Pontiac Firebird’s new grille was less aesthetically successful than the original beak and an awkward addition to the basically unchanged body shell. By that time, you’ve moved on to revamping the ’69 Grand Prix, which turns out to be another big hit. Pontiac sales for 1968 hit a record 910,482 cars, and on February 1, 1969, your boss, Roger Kyes, tells you that you’re going to be taking Pete Estes’s place as general manager of Chevrolet, GM’s biggest and most powerful division. You’re a little nervous — Pete has told you that Chevrolet is an unwieldy monster — but it’s a hell of a step forward. You’re still only 44 years old and it looks like the sky’s the limit. As it happened, DeLorean’s tenure at Chevrolet would be relatively short-lived. After he was in place, he quickly realized the many problems that had eroded the division’s efficiency and profitability. DeLorean claimed later that he tried to fix them, but he clashed too often with the entrenched power structure, making him a lot of new enemies. He was promoted to group VP in 1972, which DeLorean saw as a way of shutting him up and denying him any real power. Not long afterward, on May 31, 1973, he resigned. DeLorean went on to write a scathing tell-all book with J. Patrick Wright, entitled On a Clear Day You Can See General Motors: John Z. DeLorean’s Look Inside the Automotive Giant, detailing the serious problems he saw in the General Motors organization. DeLorean subsequently canceled the book, perhaps fearing he’d gone too far in raking his former employer over the coals, but Wright published it anyway. We are inclined to take some of the book’s assertions with a grain of salt, but it is a bitingly candid portrait of GM’s corporate culture. DeLorean, of course, would go on to build and market his own sports car, the DeLorean DMC-12, which suffered from various financial problems and then from the publicity of DeLorean’s infamous drug bust. He was acquitted of all charges in 1984, but ongoing legal problems haunted him until his death in March 2005. 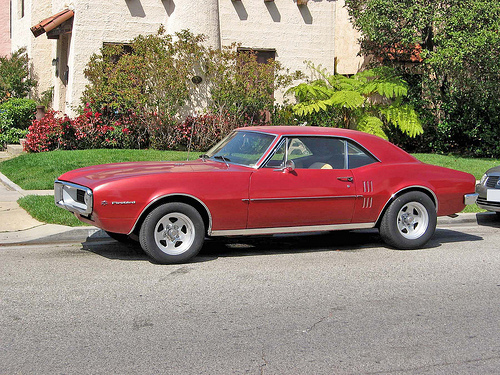 The Pontiac Firebird, along with its Camaro brother, received a deft redesign for 1970, work on which actually began in the fall of 1966, before the first-generation even went on sale. The dramatic new look would soldier on through 1981 with a number of facelifts. As with many of its pony car rivals, the Firebird suffered a serious sales slump in the early seventies, but rebounded once the fallout of the 1974 OPEC oil embargo had subsided. By 1978, business had improved greatly, thanks in part to the Trans-Am’s role in the popular film Smokey and the Bandit. The third generation arrived in 1982 with swoopy, futuristic bodywork, later used for the talking super-car KITT of the TV show Knight Rider. Performance, which had waned in the late seventies and early eighties, gradually recovered and the the fourth-generation ‘bird, launched in 1993, was even quicker than the original. The Trans Am model, true to DeLorean’s predictions, remained a popular part of the line-up until the end, sometimes accounting for more than half of all Firebird sales. If DeLorean had gotten his way, it’s unlikely that the Banshee sports car would have sold nearly as well as the Firebird; in that sense, GM management had a point. Moreover, given GM’s track record in that territory (e.g., the Pontiac Fiero), the Banshee likely would’ve been badly compromised before it even reached the market. But it would have been unique and it wouldn’t have reminded anyone of a Camaro. Our sources for this article included C. Edson Armi, The Art of American Car Design: The Profession and Personalities (University Park, PA: The Pennsylvania State University Press, 1988); the Auto Editors of Consumer Guide, Encyclopedia of American Cars: Over 65 Years of Automotive History (Lincolnwood, IL: Publications International, 1996); Jeff Denison, “Behind the Mastermind of Pontiac’s Chief Designer Jack Humbert, The Unsung Hero of Pontiac Design,” High Performance Pontiac October 2009; John Ethridge, “Sporty Specialties: Cougar & Firebird,” Motor Trend Vol. 19, No. 5 (May 1967), pp. 34-37, 41-42; Kit Foster, “1967 Pontiac Firebird Sprint: OHC from John Z’s PMD,” Special Interest Autos #150 (November-December 1995), reprinted in The Hemmings Motor News Book of Pontiacs: driveReports from Special Interest Autos magazine, ed. Terry Ehrich (Bennington, VT: Hemmings Motor News, 2001), pp. 118-127; John Gunnell, ed., Standard Catalog of American Cars 1946-1975, Revised 4th Edition (Iola, WI: Krause Publications, 2002); Dave Holls and Michael Lamm, A Century of Automotive Style: 100 Years of American Car Design (Stockton, CA: Lamm-Morada Publishing Co. Inc., 1997); Don Keefe, “Department X: The 1964 OHC-6 Banshee Coupe,” High Performance Pontiac November 2001, pp. 38-41; J. William Lamm, “1968 Pontiac Firebird 400: Pontiac’s Original Pony,” Special Interest Autos #95 (October 1986); Michael Lamm, “The Fabulous Firebird: Developing the Second Generation” (which is actually an excerpt from Lamm’s book, The Fabulous Firebird), Special Interest Autos #57 (June 1980), pp. 42-49; Jan P. Norbye and Jim Dunne, Pontiac, 1946-1978: The Classic Postwar Years (Osceola, WI: Motorbooks International Publishers & Wholesalers, 1979); “Pontiac’s Chiefs,” Motor Trend Vol. 17, No. 2 (February 1965), pp. 76-79; “Pontiac Firebird 400,” Car and Driver March 1967, reprinted in Car and Driver on Pontiac 1961–1975, ed. R.M. Clarke (Cobham, England: Brooklands Books Ltd., ca. 1985); Eric Dahlquist, “Firebird,” Hot Rod February 1967; “Pontiac Firebird 400,” Car and Driver March 1967; Fred MacKerodt “First Drive: Pontiac Firebird: Is the Firebird Just Another Camaro?” Cars March 1967; John Ethridge, “Firebreathing Bird…First of the Spring from Pontiac,” Motor Trend March 1967; “A Brace of Birds: The Sprint and the 400 from Among Pontiac’s Five Firebirds,” Car Life August 1967; Steve Kelly, “Trans-Am Firebird: A corner-turnin’, quarter-burnin’ muscle car,” Hot Rod March 1969; Jerry Titus, “Road Test: Pontiac Firebird Trans-Am: A Fiery Bird Goes Trans-Am…or, Is this any way to run an aviary?” Sports Car Graphic April 1969; and “Trans-Am Firebird: The Firebird gets a racy name and a spoiler, but it’s still a long way from race-ready,” Car Life April 1969, all of which are reprinted in Firebird and Trans-Am Muscle Portfolio 1967-1972, ed. R.M. Clarke (Cobham, England: Brooklands Books Ltd., ca. 1998); “The Mustang and Its Imitators,” Road Test October 1967; “The Sporty Cars: Javelin SST vs. Camaro SS396 vs. Firebird 400 HO vs. Mustang 2+2 GT vs. Barracuda Formula S vs. Cougar XR-7,” Car and Driver March 1968; and “Five Car Stud: Camaro RS/SS 350 vs. Mustang Mach 1 vs. Cougar XR-7 351 vs. Firebird 350 vs. Javelin SST 343,” Motor Trend March 1969, which are reprinted in The Great Classic Muscle Cars Compared (Muscle Portfolio), ed. R.M. Clarke (Cobham, England: Brooklands Books Ltd., ca. 1999); Jerry Titus, “Driving the Chevy II,” Motor Trend December 1961, and Bob McVay, “Chevy II V-8 Road Test,” Motor Trend June 1964, both of which are reprinted in Chevy II · Nova & SS Muscle Portfolio 1962-1974, ed. R.M. Clarke (Cobham, England: Brooklands Books Ltd., ca. 1995); C. Van Tune, “Retrospect: ’67 Pontiac Firebird 400,” Motor Trend Vol. 43, No. 12 (December 1987), p. 56; and J. Patrick Wright, On a Clear Day You Can See General Motors: John Z. DeLorean’s Look Inside the Automotive Giant (Chicago, IL: Avon Books, 1980). A coworker once suggested that there was no need for engineers because there was a nifty spreadsheet that could find all the answers. I replied that I created that spreadsheet. Like sample physics problems that have a cruise ship stopping from 65mph in 300 feet, calculation is nothing without understanding. From a certain standpoint, the Mono-Plate springs made sense. Given GM’s obsession with a soft ride, the lack of inter-spring friction was appealing, and it was definitely cheap. In a six-cylinder Chevy II, with no torque to speak of, its lack of axle control wasn’t as big a deal (it didn’t help braking, but GM didn’t care a lot about that). So, it made that much sense. Applying it to the F-body? Not so much. Funny you mentioned the taillight design of the 67-68 models. Pontiac must have evidently liked them as they reappeared 2 more times, on the ’73-’74 Ventura and the ’75-’77 Vega-clone Astre. Jack Humbert did remain Pontiac chief stylist for quite a while after the first-gen Firebird, and GM policy was to let styling features “trickle down” from most expensive to cheapest models, so that makes a certain amount of sense. I have seen this posted too many times “…Trans Am sales rebounded thanks to the movie ‘Smokey and the Bandit’… ” and it’s not 100% correct. F-body sales started warming up during the 1974 model year. Yes, there was a fuel crisis, but there were quite a few young adults who wanted the smaller sporty cars. By fall 1975 for the 1976 model year, T/A sales were way up from 1972. This is a full 2 years before “S&B” was released in the summer of 1977. Also, the black and gold packaged T/A was released late in the 1976 model year, and then was more widely available for 1977 models released in fall 1976, nearly a year before the movie. So, reality is the the movie did not ‘single-handidly’ make T/A sales go up. They were already doing well, and the movie reflected the car’s existing popularity. The large sales #’s for the 1978 and 1979 model were partially from the movie. But also, the word got out that the 6.6 liters motors were ‘the last ones’ available before 1980. By the time of ‘fuel crisis 1979’, all the 6.6 cars were sold. The article on this site on the 1980 Turbo T/A correctly states the history of that vehicle, but giving “S&B” all the credit for T/A sale is overdoing it. That’s a fair point. The Turbo T/A article does not give [i]Smokey & the Bandit[/i] sole credit, but it was implied here, so I’ve amended the text. The T/A sales phenomenon of the mid 70’s flew in the face of ‘malaise’ and low HP emissions motors. Would be a good article detailing its success, after other performance cars had died already. I think the Firebird and Camaro really benefited from being last man standing in the pony car class. A lot of buyers were apparently not that concerned with real performance (since it had become so expensive to insure), so long as a car [i]looked[/i] tough — the rather toothless late-seventies ‘Vettes sold really, really well for similar reasons. In the Monte Carlo article, I talked a little about the range of choices available to buyers in that period. Basically, if you wanted something that wasn’t a basic sedan or wagon, your choices were relatively slim, and the F-bodies were among the few remaining sporty cars that were in something resembling an attainable price range. I have to take issue with your assessment of the late seventies vettes as toothless. I owned a 69 firebird 400 and was going to replace it with a 76 vette. I bought the vette but didn’t sell the FB right away. In terms of handling and stopping the vette had it all over the FB. Can’t say for sure which one was really the fastest (my FB was equipped for cruising, 2.56 rear end, not drag racing) but the vette was plenty fast for any form of street driving even if it wasn’t up to the supercar standards people like to hold vettes to. After six months I sold the vette because on the freeways I had to drive every day the vettes ride was just too punishing – I got a headache from the constant pounding of the concrete pavement joints. While the FB was no limousine it did have an acceptable ride plus in the 10 years I owned the FB it only let me down a couple times due to malfunctions. The vette left me stranded twice in the 6 months I owned it due to lousy quality parts. A friend of mine who bought one at the same time had to have his whole rear end rebuild shortly after it was out of warranty. Just as a reference point, I also considered buying a Mercedes 450SL to replace the FB but after driving one I felt it deficiencies were too serious for my needs – AC was lousy (important in the Arizona Heat), the autotrans started in second gear unless you literally shoved your foot to the floor, which made it rather dull off the line in anything approaching normal driving, and there was no room for my feet under the dash, it was impossible to swivel my left foot while it was on it’s heel from the left to the right to cover the brake pedal – the lower dash cover panels went down so far the toe of my shoe smacked into it. As I long suspected, deletion of the vent windows, and the ’69 restyling were mistakes. As an owner and driver of a ’67 its nice to be vindicated by history. The Pontiac 350 isn’t a 350 at all, in fact it’s not even a 353.8. A 3.88 bore and a 3.75 stroke yields 354.71 or rounded up at 355 cubic inches. This is a great engine. I ordered 355 H-O, 330 HP in my 69 LeMans. No problem dusting stock 383 Road Runners or 390 Fairlanes. Geesh, my service manual says 3.88. Maybe it means 3.875 rounded up? Also my service manual for my 250″ Chevrolet engine also says 3.88. Anyroad, a 353.7973 or 354 could be used as a selling tool. Consider this, would a big block Chevy sound better in advertising as a 454 or 450 if it was really a 454?? Service manuals typically round to two decimal places, but generally 0.88 is 7/8ths rounded to two decimal places, just as 5/8ths is typically rounded to 0.63 (etc.). In any case, the rationale for advertising it as a 350 rather than a 354 was likely the contemporary GM corporate policy on maximum displacement for the A-bodies. Senior management wasn’t inclined to make an expensive fuss over a few cubic inches, but the divisions generally toed the line so far as their advertising went (witness the way the Buick Skylark Gran Sport advertised 400 cubic inches even though the 1965–66 cars had the same 401 cu. in. displacement as the base engine in the B-body and Riviera). Also, Buick and Oldsmobile might well have balked! There were a lot of these sort of games, like the fact that the later 5-liter Pontiac V-8 was advertised as a 301 so people wouldn’t assume it was a Ford engine despite having the same bore and stroke as the Ford 302. Aaron, forgot to ask you if you would ever consider doing a article on John DeLorean’s project, the 1961-63 Tempest. The 326 badged engine in 1963 really being a 336 would also be interesting on how and why that came about. Something to think about. I’ve never done the rope-drive Tempest because photos have always been a major headache. The rope-drive cars are very thin on the ground these days. I don’t think I’ve ever seen one on the street (even in L.A.!) or at a show, even local all-GM events. I have noticed that the 69 Firebird as different steering components than the Camaro. The Drag Link, Inner Tie Rods, idler and pitman arms. Anyone know why? Is a a pontiac handling thing or so they would clear the pontiac engine? what part did Porter play in design of the Firebird? A surprisingly complicated question. 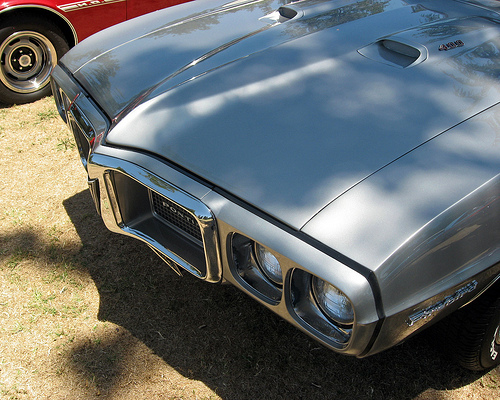 Porter played a big part in the design of the second-generation Firebird, but the 1968 Pontiac GTO had been based on a concept he had done in Advanced Two, before joining the Pontiac studio. So, while I think the first-generation Firebird was already a done deal at the time Porter was actually at Pontiac, some of his styling ideas may have influenced Pontiac’s approach to that project. Porter also worked on the old Firebird III concept car, although there wasn’t really any relationship between that and the production car other than the name.